During the past generation, childhood has undergone a profound and, largely ignored transformation. One study found that the average American boy or girl spends four to seven minutes a day outdoors. Another placed the estimate at about thirty minutes of daily, unstructured, outdoor play. Whatever the actual number is, it seems pretty clear that children today spend a tiny fraction of the time playing outdoors that their parents did as kids. By comparison, those same average American kids devote more than seven hours daily to staring at screens, replacing reality with virtual alternatives. Most boys rack up more than 10,000 gaming hours before age twenty-one. Children can now recognize greater than a thousand corporate logos, but fewer than ten plants native to their region. These staggering statistics indicates that huge gap between our children and nature. This indoor migration has been a massive, unplanned experiment with negative healthy consequences only now coming into view. During those marathon screen sessions, bodily exercise is restricted largely to finger movement. Unsurprisingly, chronic physical and mental illnesses in children have skyrocketed. Today, about 18 percent of our kids six and older are obese, with diabetes, heart disease, and other illness both rampant and on the rise. As of 2011, about 11 percent of American children four to seventeen years of age had been diagnosed with attention deficit hyperactivity disorder (ADHD). In 2014, nearly six million children in the United States, one in eight, took Ritalin, largely to combat ADHD. According to at least one U.S. surgeon general, the present generation of children may be the first of modern age with a life expectancy less than that of their parents. To be clear, this problem isn’t restricted to the United States, or to North America. Recent surveys show the same rampant denaturing trend occurring throughout much of the developed world. Recognition of this issue is growing as well, with the majority of people strongly supporting the idea that children need more time in hands on activities and outdoors in nature, and stay away from the screen such as TV and iPad. Well, the digital revolution for one thing. Perhaps even more so than adults, children are highly susceptible to the hypnotic siren call of computers and handheld gadgets. Yet blaming technology is far too simplistic many other factors have been involved such as the fear factor, for example. Thanks to the media frenzy that now surrounds child abductions, parents are afraid to let their children play outdoors unattended. This is in spite of the fact that friends and relatives, rather than strangers, commit the great bulk of these crimes, and that the odds of your child being snatched are no greater than they were in 1950 and 1960. And well-intentioned parents fearful of their children somehow falling behind or missing out have filled their schedules with sports, music lessons, academic tutoring, and other organized activities, with little time left for unstructured hands-on play and outdoor play. Then there is the urban factor. The world’s population has exploded in recent decades, with cities following suit to accommodate the growing throngs. Since late 2008, more than half of humanity’s billions have inhabited urban areas. Like ravenous giants, expanding cities have swallowed up ore and more nature, and degraded what’s left behind. Recent research demonstrating that abundant time in nature is a critical wellspring of human health, with a deep and formative influence on children in particular. Nature’s impacts extend far beyond physical fitness, encompassing intellectual and emotional health, self-identity, and basic values and morals. Health benefits of exposure to nature include enhanced healing, stress reduction, creativity, and self-esteem. Nature also has an unparalleled capacity to stir our emotions, fostering raw and powerful feelings of wonder, awe, mystery, joy and fear. As any parent or early childhood educator will attest, play is an innate drive. It is also the primary vehicle for youngsters to experience and explore their surroundings. Compared to kids confined indoors with digital media, children who regularly does hands-on activities and play in nature show heightened motor control – including balance, coordination, and agility. They tend to engage more in imaginative and creative play, which in turn fosters language, abstract reasoning, and problem-solving skills, together with a sense of wonder. Why is hands-on play and play in nature so powerful? For one thing, it offers a multi-sensory activity of seeing, hearing, touching, and tasting, immersing children in a much grander world than can ever be captured on a computer or TV screen. For another natural play spaces tend to be complex, with a far greater variety of unspecified props (rocks, sticks, mud, plants, etc.) so they stimulate more creativity and imagination. Then there is that all important sense of wildness engendered by birds, trees, insects, and various creepy-crawlies, along with the potential to create special places away from prying adult eyes. We understand the importance of nature for our child but question is how… How might we let our children fall in love with nature and Play & Learn? Here are 20 Ways to let your children fall in love with nature and play & grow healthier. A deep connection with nature doesn’t arise only through periodic trips to national parks or other wilderness. While such trips can leave deep impressions, even more important are abundant experiences in wild or semi-wild places, typically close to home. Changing behaviors is all about making new habits. So start a habit of getting the children in your life into nature more often. Take some time to discover the varieties of wild or semi-wild nature close to your home and explore these places with your children. For young children, it might be the local park, the schoolyard, or your backyard. Even a few minutes a day is a great start. Chances are you and your kids will quickly discover that there is far more to see and do than you imagined. Most young children will have no problem engaging with their natural surroundings. There curious minds are built to just that. Older children who have established a bias toward electronic screens may take a little more coaxing; this is where grown-ups need to exercise some imagination, and even foster a trickster mentality. Rather than telling children that they need to go out because it is good for them, think about encouraging them to play games like tag and pick the can. The key here is to establish nature as the fun and preferred option for playtime. And here is another habit to work on: The more you demonstrate the value of nature through your own actions; the more kids will tend to adopt the same value. Regular doses of nearby nature are absolutely essential for nurturing a deep connection with the natural world. Yet periodic escapes into wilderness offer another, entirely different, exceptionally powerful experience, a grand banquet of seeing, hearing, touching, even tasting that taps deeply into our emotions. No virtual simulation can compare to hiking a glacier-capped mountain, or a face-to-face encounter with a moose, fox, or cow. Nature viewed on a screen is detached, almost imaginary. In contrast, a growing body of research suggests that immersion in wilderness not only awakens the senses and provokes deep thoughts and feelings. It also leads often to transcendent experiences that deepen the bond with nature. Does falling in love with nature require regular wilderness trips? No. Does such a connection require at least some wilderness time? Almost certainly. So make the effort to plan trips to wild places, whether for camping, hiking, fishing or just hanging out on weekends. Bird feeders, birdhouses, and birdbaths are perhaps the easiest add-ons. Others include seeding native plants (which attract native insects). If you are adventurous, relatively simple backyard makeovers- complete with rocks, logs and pond – can turn some of your backyard into a natural wonderland, and cut down on grass-cutting! You will be surprised by the numbers of cool creatures that will make an appearance if you only invite them! First big step in deepening children’s connection with nature is for you to start noticing it. If you don’t pay attention to the natural world, it is doubtful that your children will. So when you step outside in the morning, instead of rushing to the car, pause for a moment. Feel and smell the air. Check out the clouds and the trees. Listen to the birds; What kinds of birds are they? When possible, take time to enjoy sunsets, freshly bloomed flowers, budding trees, and the smell of newly fallen leaves. The goal is simply to become more aware of the natural wonders around you. Forming a nature habit won’t take much time, and it will pay big dividends for you and the your kids. Take some time to discover the varieties of wild nature close to your home and explore these places with your children. For young children, it might be the local park, the schoolyard, or even your backyard. Once again, the key is simply to take notice. For older kids (six to eleven years), venture slightly farther afield; something as simple as walking up a creek can be a grand adventure. Or head to the local nature preserve. Where possible, get off the beaten path and do some exploring. Encourage children to notice nature with you. Most kids need little enticement. Make a game out of counting bird varieties that you can see or hear. Invite them to figure out which flowers smell the best. You don’t need to be an expert. You don’t even have to talk. Simply sitting down with them to enjoy some quiet time in natural surroundings, even in your backyard, can be a powerful experience for you both, especially as your senses awaken to the surrounding life. And remember that kids connect best with nature by physically engaging with it. So let them get dirty. Even encourage it! 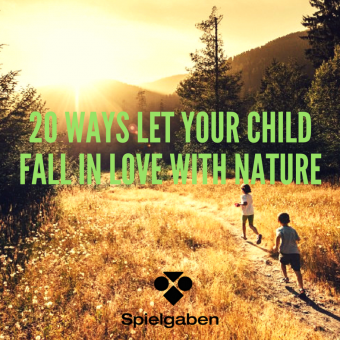 Websites to movies, nature related media can promote nature connection but books or physical constructive toys such as Spielgaben that can emulate nature related activities are arguably even better, because they encourage imagination. (5) dirt. (Spielgaben has all of those other than dirt). What do all of these toys have in common? All of them qualify as “loose parts,” things with no designated role. In other words, such toys can be adapted to an almost infinite range of purposes, limited only by children’s imaginations. Get some kids and head out into nature. For at least a portion of the time, invite them to go hunter-style, moving slowly and quietly to see what they can see, hear, and smell. Remind them that the animals will run away if they are too loud. See what kinds of mysteries you and your kids can find while in this stealth mode-things that capture their interest. Then ask some questions about them. What does it feel like? Does it have a distinct smell? How many colors can you see? Why do you think it is shaped like that? Correct answers aren’t important. The goal is to mentor your kids to stretch senses and fuel curiosity. Make sure you display your own passion for the discoveries that you find most intriguing. Consider taking photos of them. Afterward, go over the list or photos with the children and see if you can extend youngsters’ engagement by playing with the edges of their understanding. Find a place in order adjacent to a natural setting where you can sit and observe. Pick a place that is close – for example, in the backyard, courtyard, or neighborhood park – so that it’s easy to get to. Remember, the best sit spot is the one you use! Visit your sit spot regularly, preferably daily or at least several times a week, and sit quietly there, observing with all your senses. If possible, stay for thirty to forty minutes, but even five minutes is far better than nothing. Listen for birds and other animals, tracking your observations with notes and pictures in a nature journal. If the kids in your life are seven or older, encourage them to do the same. Vary the time of day, enjoying morning, noon, and night, to see how your sit spot changes. Eventually, you will come to know this little corner of the universe better than anyone else. In general, middle childhood is the best time to initiate a sit spot for kids, starting with just a few minutes at a time and building slowly from there. For adolescents and adults, there may be no better way to deepen nature connection. And you will quickly find that this activity changes the way you and the youngsters in your life experience where you live. One of the most essential mentor roles is being the Questioner. After kids spend time outdoors, ask them what happened. What did they see, hear and feel? What was their story of the day? Make sure the bulk of your questions are easy to answer, particularly at the start, so as to build confidence. Then try a few tougher questions that cause the children to really think and stretch the boundaries of their knowledge and experience. If you happened to notice that a particular bird was singing, ask the children if they noticed it. Once in a while, if you think the children are really hooked, drop in a mystery – something you may not have the answer to that’s just beyond the kids’ edges. Then return to that mystery once in a while to see if they have made any progress on it. Or think about seeking the answer together. The most important thing here is to get into the habit of asking questions. In addition to the lessons learned, being the Questioner shows how you value both nature and the children’s experience. Make nearby nature – whether in the backyard, park, or schoolyard – one of the primary places for children’s learning. The educational focus need not always be on the natural world. Thanks to its many physiological benefits, nature is a great place for just about any kind of learning. Think about having your kids to their homework outdoors some of the time. Reading can be done while sitting under a tree, and math is more fun when done with a stick in the dirt or sand. As a mentor and parent, remember to engage your core routines, that is, such as wander, sit spot, story of the day, and questioning. Use these routines to help deepen awareness of the big picture. Start by listening to a child talk about her experience outdoors and then find a mystery that will help pull her to the next level of awareness. If she talks about a bluebird, ask her to keep an eye out for what that bluebird is doing. Sometimes, as she heads outside, give her a question to ponder, like, “What kinds of creatures do you think take care of the recycling around here?” It doesn’t matter if you have no idea what the answer is. You are merely the catalyst, the co-explorer who’s anxious to hear about the child’s discoveries, and fascinated to find out more. The point here is to remind children that there is a big picture, an invisible set of threads that ties everything together. Their challenge (and yours) is to learn to become aware of some of those threads. One of the most powerful ways to connect kids with nature is to raise their awareness about food. Grow a garden with children’s help and watch them being to love eating their veggies. If you can afford the extra expense, eat predominantly local and organic foods purchased from places like farmers’ markets. Each evening before dinner, take a moment with your family to give thanks to the plants and animals that are about to sustain your bodies. In our fast paced lives, we rush through meals, rarely pausing to consider the source, or even the taste, of foods we consume. Nature connection begins with awareness, and healthy food is a wondrous place to start. Take the kids out to a nearby working farm so that they can see plants, pigs, chickens, and cows being raised for food. Many farms now offer opportunities to volunteer for a few hours or a day, or for visitors to harvest their own fruits and vegetables, giving children and adults firsthand experience. Once you have visited a local farm, regularly bring home food produced there and remind kids where that food comes from. The memory of their visit will change the way they think about food, and make that pre-dinner expression of gratitude even more powerful. Although nature may be slowly disappearing from children’s books, you can still find numerous titles that feature nonhuman characters. Your local library is bound to have plenty of examples appropriate to any age. One of the greatest predictors of children’s reading abilities is whether or not their parents read to them daily. So fill their imaginations with fairy tales and other stories full of amazing landscapes and magical creatures. Action #15) Create Your Own Stories! Once in a while, put the storybooks and renew the sensuous art of storytelling grounded in local nature. Use your whole body and voice to answer questions such as where did those fir trees come from, and why are they so tall? Who lives in our local pond, and how long have they been there? Why did coyotes and rabbits survive the last ice age while mammoths and saber-toothed cats disappeared? Your local library, natural history museum, or nature center will be happy to provide the necessary fodder. The goal here is to animate nearby nature, to bring it alive through narratives. This is exactly what indigenous peoples have done for thousands of years, wherever they lived. If you tell stories like these even once in a while, you and the children will start to understand, and experience, your local place very differently. Think about how you might combine stories and outdoor experience to convey various aspects of science and nature, transforming abstract insights into felt encounters. For example, head outside under a starry night sky to share the secret that all animals, including us, are made of stardust. For teens, head to a forest and tell them why they share about a quarter of their genes with the trees and oxygen that they are breathing is made. Action #17) Free Play Rules! One of the essential rules of nature mentoring is to enable children to fulfill their innate longings. Young kids long to play; it is what they are designed to do. So carve out some regular time for the children to engage in unstructured play indoor and outdoor. Unstructured here means free play without adult guidance or supervision. Encourage kids to create their own imaginative games and activities using loose parts and hands-on manipulative that preferably do nature related activities such as Spielgaben to children’s playspaces. For outdoors, the addition of natural elements such as rocks, logs, water, and sticks will likely transform the play experience outdoors. The goal here is to allow children’s imaginations, as well as their bodies, to run free and be creative. Feel free to sit back and let the kids run the show. If you do engage, be sure to follow rather than lead. Remember that for free play to be truly free, children must be the bosses. Too often these days, children’s encounters with nature are dominated by a look but don’t touch directive. Fearing that we must protect nature and our kids at all costs, we often do far more harm than good. Nature connection is a messy, dirty business – picking leaves and flowers, turning over rocks, holding wriggling worms, splashing in ponds. Lacking such experiences, children’s growth is impoverished and they are unlikely to care for, let alone protect, natural places. So loosen up and find some hands-on nature experiences for the kids. There is something powerful about being outdoors at night immersed in a natural setting, no matter what your age. Beaches, deserts, forests, even neighborhoods take on an entirely different feel in toe dark. And, of course, different creatures come out after the sun goes down. So, assuming you can find a safe place, seek out opportunities to take children on nighttime adventures, even if it’s just a walk around the block or some quiet time in the backyard. Watch them closely and see where their interests (and fears) are directed. Be authentic and open yourself up to rekindling that childlike sense of wonder, chasing their passions as well as your own. If you exercise this kind of engaged playfulness, the child will feel more secure and do the same. The end result will be a growing sense of wonder in both of you. If you haven’t found a nature activity that you are passionate about, consider putting some effort into it. Yes, most of us are extremely busy and find it difficult to carve out time for anything new. But the reality is that with rare exceptions, most young kids these days aren’t going to get out into nature unless we take them there. And let’s face it: you are unlikely to do that unless there is some compelling reason to get you there. So try to find an activity-whether it is close to home, like gardening, or far away, like fly-fishing or snowshoeing – that you can engage in with the children in your life. Along with actually getting you and the kids about into nature, potential pluses include deepening your own nature connection, allowing you to model the value of nature (and your own connection), providing a ready source of narratives for telling stories, and establishing a skill that children can also work on developing over time. We hope this article helps you & your kids fall in love with nature and grow healthier and happier life. Do share with us how you progress. We would love to hear. Scott D. Samson (2015). How to Raise Wild Child. Anna Botsford Comstock (2011) The handbook of Nature Study. Jennifer Ward (2008) I love Dirt!